A century ago 2.6 million people lived in Iowa, the number of farms was just under 200,000, total land in production was 32.9 million acres and farmland averaged just over $100 per acre. Through the ups and downs, generations of farms across Iowa endured tough economic times, weather, and hardships to keep the farm in the family. They were honored Thursday. 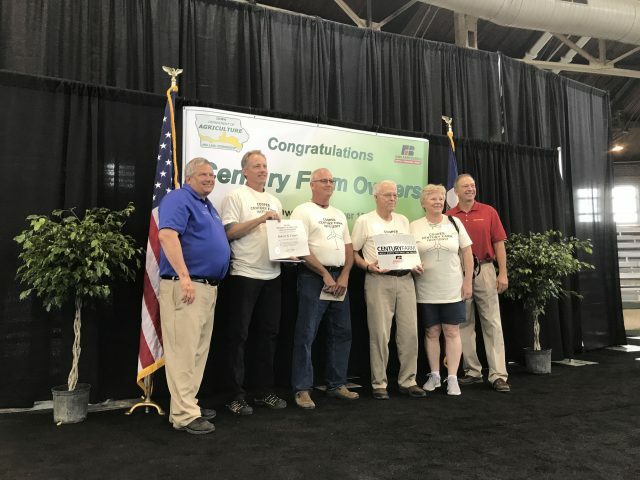 The Iowa Department of Agriculture along with the Iowa Farm Bureau Federation awarded farm families with the Century and Heritage Awards. One of those families was the Robert H Cooper family who farms in Adair County. It was started back in 1917. “It is a great feeling (to get this award). My grandfather was the first to own our farm and my mother purchased it from him when she got married. The farmhouse is still there where I was born. I’m glad all of my kids and family could be here today.” Robert Cooper says. Over the past 41 years, 19,350 families have crossed the stage at the Livestock Pavilion to celebrate Centennial farm ownership at the Iowa State Fair. Iowa Farm Bureau President Craig Hill says it’s amazing. Iowa Secretary of Agriculture Bill Northey says this is his favorite day of the year as secretary. This is the 11th year for the Heritage Farm awards. There were 119 Heritage farms and 354 Century honored.